Jacob E. Matteson age 16 of Marion, Ohio passed away unexpectedly Friday, November 30, 2018 at Marion General Hospital. He was born January 5, 2002 in Marion, Ohio to Jaime L. (Persinger) Septer and Brock L. Matteson, his parents survive in Marion. 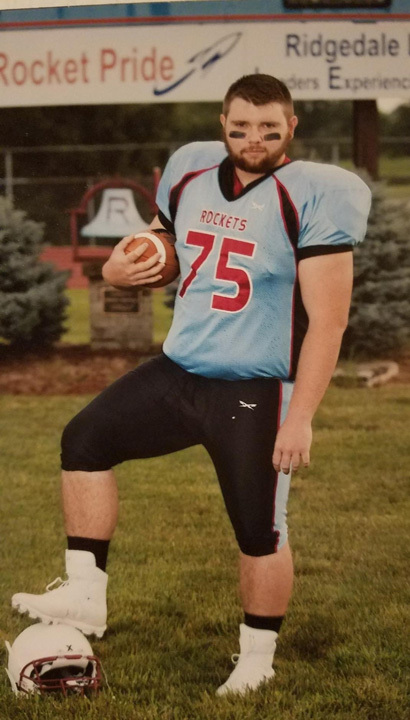 Jacob was a Junior with an unforgettable smile at Ridgedale High School, he was a member of the Rockets Varsity Football Team playing offensive and defensive line. He loved being in the weight room pushing himself and his teammates harder. He loved spending time with and will be greatly missed by his family, friends and his Ridgedale Family. He is survived by his parents, his sister, Jenaca Matteson of Marion, half-sisters, Makaylah Matteson of Marion, Aliza Hamilton of Marion, his half-brother, Brock Matteson Jr. of Marion, his Maternal Grandmother, Linda Persinger of Marion, Paternal Grandmother, Patricia Toombs of Marion, Aunts, Tracey (Rob) Layne of Marion, Martha Matteson of Marion, Uncles, Tim (Jamie) Persinger of Marion, Dan Logan of Marion and his brothers from another Mother (Like Jake always said), Bobby Bruce, Jesse Schertzer, Myles Nutter, Trystin Bivins, Branden Jaggers and his Ridgedale Football Brothers. Jacob was preceded in death by his Grandfather, Bill Persinger, his aunt, Lydia Logan and his step-father, Jason Farmer. Visitation will be held Thursday, December 6, 2018 from 4 – 8 PM at Marion Bible Fellowship, 590 Forest Lawn Dr. Marion, Ohio. A service will follow at 8 PM with Pastor Rohan Anderson officiating. The Boyd-Born Funeral Home is honored to be serving the family.